Revisited Records has now released the fourth Eroc solo album, recorded in 1982. For those of you who don’t know, Eroc is the pseudonym of Joachim Heinz Ehrig who was Grobschnitt’s drummer turned sound explorer and producer. With the success of “Wolkenreise” from Eroc 3, he left the hectic life of Grobschnitt in 1983. 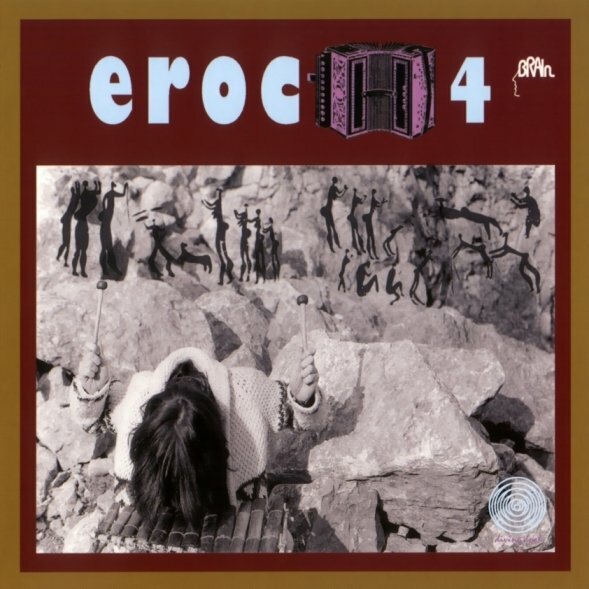 Each Eroc album is unique, and Eroc 4 is a mellow affair sounding a bit like a mixture of Bavarian folk, electronic, and Krautrock. I don’t understand the cover photo of Eroc playing a native xylophone amongst rocks with pseudo-petro glyphs. I guess you can’t judge a CD by its cover, because I was expecting an entirely different kind of music. The best parts of Eroc 4 are when he sounds like Michael Rother on “Brauntöne” or when his humor shows on “Hagener Wellenreiter” with crazed vocals and German narrative. Though not the best of the four Eroc reissues, it does have its moments. In addition to the ten original tracks there are twelve bonus tracks ranging from one to six minutes in length. Eleven of these tracks are from the mid 80s and the twelfth, “Radio Puschkino,” is from 2004. These bonus tracks are a perfect companion to the original release and are, in my opinion, far better. At least they are edgy and stay away from the Bavarian folk influence of the original release. Eroc 4 is really for completists and if interested, I suggest that you start instead with Eroc Zwei.